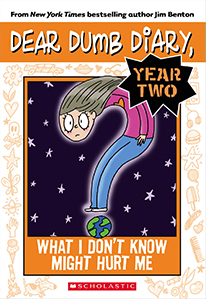 Home > Dear Dumb Diary > Dear Dumb Diary - Year Two #4 - What I Don't Know Might Hurt Me. Dear Dumb Diary - Year Two #4 - What I Don't Know Might Hurt Me. Just when I was pretty sure we could let the Student Awareness Committee quietly die a dignified death like some majestic old elephant or the Square Dancing Club, Angeline has to be aware of something. Great. And, of course, it couldn't be something interesting like nail polish or why maybe ther should be a special class in nail polish and how to get it out of your beagle's ear. (Mom, if you're reading this, I'm not admitting anything. Somebody else could have painted a heart in his ear.? Angeline just had to be aware of one of those THINGS THAT ADULTS LIKE.